Electric dishwashers have been around for nearly a century, but most didn’t make it into home until sometime between the 1950’s and 1970’s. By the 1980’s just about every new home was build with a dedicated space for the dishwasher. We can’t deny that dishwashers are amazing. After all, they’re dealing with every kind of stuck-on food under the sun, from barbeque sauce to spaghetti to cheese. And it’s this very combination of foods that can cause a dishwasher to stop draining properly. 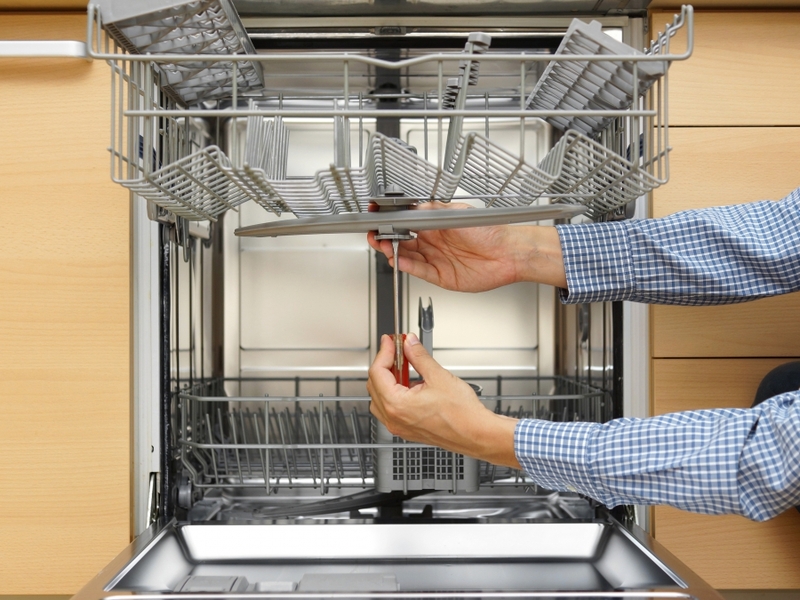 Here are a few things you can do to ensure that your dishwasher continues to run. Scrape off your food: It used to be common practice to rinse a dish off in the sink before loading it into the dishwasher. That’s not necessary anymore, but there’s nothing wrong with scraping off the solids into the garbage before putting your plate into the dishwasher. It’s pretty obvious that you shouldn’t put t-bones in the dishwasher, but it’s also a good idea to get rid of strands of pasta…basically anything solid. Find out if there’s a disposal: Some dishwashers come with a mini-disposal in them that will grind up the food before it heads out the drain, and this can be a great way of making sure your pipes are less likely to get clogged. But don’t make the mistake of thinking that every dishwasher has one of these disposals. If you move into a new home or apartment, make sure you know if your new dishwasher can handle larger bits of food. Don’t Put In Pumpkin: We wrote an entire blog about it, but it bears repeating. Some gourds will wreak havoc on your drains and sewer systems. Vegetables like pumpkins have “goop” that dries like glue and can cause big problems with your drains. Research dishwashing detergents: Not all dishwashing detergents are created equal. In fact, there’s a huge disparity in how well they work, and you don’t always have to spend the most to get the best. But some of them are going to be better at breaking down the bonds on the food particles, which is good for cleaning your dish and good at making sure they don’t stick to the inside of your dishwasher. Try this…if you’ve lived in your current location for a few years and have never cleaned your dishwasher, open it up and look at the seal behind the front door. Pretty disgusting, right? Food is getting stuck there and never washing away. Don’t automatically blame the sink: Many people will us a dishwasher their entire lives and not really have any idea what’s going on under the sink. Most dishwashers will send their wastewater out not through their own drain but will connect with the sink drain first. If you’re having perpetual problems with your sink and just can’t figure out what’s happening, the problem might not be with our sink at all. When this happens feel free to give Garvin’s a call and we can figure out exactly where your problem lies. Dishwasher can run trouble-free for a long time if treated right. But if your drains are giving you trouble and your dishwasher won’t drain, be sure to contact Garvin’s as soon as possible. https://www.garvinssewerservice.com/wp-content/uploads/2017/02/logo.jpg 0 0 Garvin's Sewer Service https://www.garvinssewerservice.com/wp-content/uploads/2017/02/logo.jpg Garvin's Sewer Service2016-01-19 21:54:012016-01-19 21:54:01What’s Going On With My Dishwasher Drain? After We’ve Verified That You Need Sewer Line Repair With Our Sewer Scope, What Are Your Options? How Your Washing Machine Washing Can Lead To Premature Drain Cleaning Do People Need A Drain Company More Or Less Than They Used To?